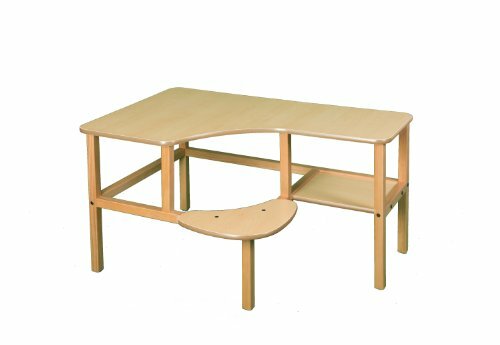 A computer desk designed especially for preschoolers, this desk comfortably fits one child ages 2 to 5 on the 18-Inch wide seat. deep enough for a full size desktop computer with solid wood legs and frame, sturdy laminated top with rounded corners and dent resistant edge banding. the attached seat means that the desk always has a chair with it and the seat won't tip over. purchase our optional hutch and add our cpu/printer stand for extra flexibility. 44.5-Inch wide by 28.5-Inch deep on the left, 15.5-Inch deep on the right by 19-Inch tall. can be upgraded to the 23-Inch grade school height with the optional preschool pc desk grow kit to add many more enjoyable years. If you have any questions about this product by Wild Zoo Furniture, contact us by completing and submitting the form below. If you are looking for a specif part number, please include it with your message.